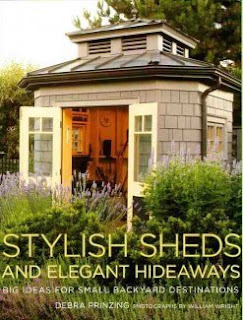 I was so excited when I received a comment from Debra Prinzing, the author of Stylish Sheds and Elegant Hideaways! This is one of the inspiring shed books that I wrote about in my first artist sheds posts. 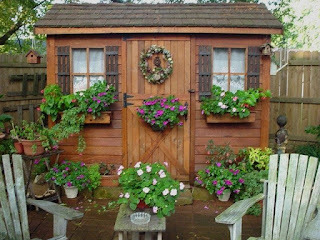 (Look in the comments sections to that post below) Debra has a shed blog, http://www.shedstyle.com/, for more information on cool shed ideas! She also has a web page at http://www.debraprinzing.com/ with more information about her book. Debra was a featured guest on Martha Stewart Living Radio - here is the link to the interview. http://www.debraprinzing.com/articles.php?article_id=51. Debra helps me to get inspired about my dream of having my own artist shed! Check out the links and imagine! Thanks Debra! Lovely photos I too have admired Debras work. If you or your readers need any help or advice on the practical side of shed building feel free to have a look at my site Secrets of shed building.com. There are still things that I have not covered yet so feel free to ask questions.